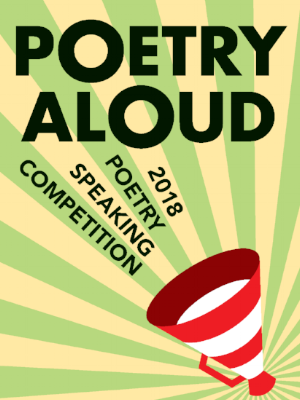 Poetry Aloud began in a very small way in 1993, as a school event with just 24 participants, but since 2006 it has become an island of Ireland celebration of the speaking of poetry, with over 1700 students taking part in 2018. Organised by Poetry Ireland and the National Library of Ireland, heats are held throughout the country, leading to semi-finals and a final, which this year, for the first time, will take place in the historic surroundings of the NLI’s Reading Room. Twenty-nine post-primary students in three different categories – Junior, Intermediate and Senior – will speak two poems each, including poems by Seamus Heaney to mark the NLI’s Listen Now Again exhibition at Bank of Ireland, College Green. The judges are John FitzGerald, poet and University Librarian and Head of Information Services, UCC, Catherine Heaney, Director of the Estate of Seamus Heaney, and Maureen Kennelly, Director of Poetry Ireland. The speaking of poetry in public captures and illustrates Helen Vendler’s definition of poetry as ‘the most speaking of written signs, the most designed of spoken utterances’. Knowing a poem in one’s head and in one’s heart means paying close attention to meaning, sound, cadence. The shaped, made poem on the page, when spoken aloud, especially by young students, becomes something special, becomes something wonderfully delivered and wonderfully received. Last year's Junior Category Winner Brendan Mac Domhnaill of Coláiste Oiriall, Co. Monaghan, with the Poetry Aloud trophy. The Poetry Aloud perpetual trophy, designed by sculptor Fiona Smith-Darragh and featuring a bronze blackbird perched on an apple, is named in honour of Seamus Heaney’s generosity and the stand carries the words, ‘It’s you, blackbird, I love’, from his poem ‘The Blackbird of Glanmore’. Throughout his life Seamus Heaney exemplified a remarkable sense of what Harold Bloom speaks of when he says that ‘the purpose of teaching is to extend the blessing of more life’. In the classroom, in the lecture hall, Heaney was always an interested, generous and committed teacher and his support of Poetry Aloud testifies to his extending that blessing of more life.